to develop leadership abilities that allow students to become successful members of the College and ultimately the global community. General Education points out intellectual connections and demonstrates that learning takes place, not in isolation, but within large intellectual and social contexts. Making these connections, students can begin to understand that knowledge of one subject or career area is related to what they know of others, that there are always more things to know and more connections to make, and that their ability to make these connections enhances the way they work and live. Accordingly, students are encouraged to link their general education studies to life outside the classroom by participating in co-curricular activities that provide opportunities to demonstrate leadership and other qualities fostered by the General Education Program. The General Education Program requirements are based on a set of ten All-College competencies, which include courses that initiate (First Year Seminar) and culminate (Senior Capstone) a student's college experience. Every general education course addresses one or more of the All-College competencies. 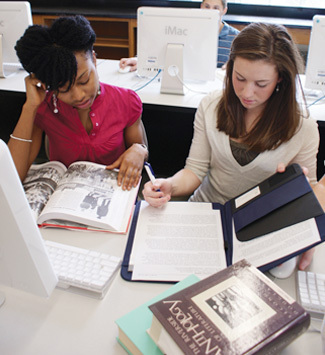 All-College competencies are integrated across all Cazenovia College degree programs (majors) as well as co-curricular and extra-curricular programs. While the academic General Education requirements prepare students for leadership, students have the opportunity to demonstrate those qualities in the College’s leadership and co-curricular programs. Depending on major, required coursework will foster significant further development in the All-College competencies beyond the gateway requirements of the General Education Program. The ten All-College competencies addressed by the General Education Program are listed below. Written Communication. To produce writing that is appropriate to audience, context, and purpose. Spoken and Interpersonal Communication. To communicate effectively through conversation and oral presentation in both informative and persuasive contexts. Ethics. To understand the principles underlying ethical conduct and apply them in making life choices and workplace decisions. Quantitative Literacy. To demonstrate proficiency in the use of mathematical or statistical reasoning. Cultural Literacy. To develop the skills and cultural knowledge base necessary for effective membership in the larger community; to read and comprehend artifacts and texts in their historical and cultural contexts. Scientific Literacy. To understand the methods of scientific inquiry used in the natural, behavioral, and/or social sciences and how science affects our lives and our culture. Diversity and Social Consciousness. To demonstrate an awareness of the diversity that exists among all human groups and develop the necessary skills to understand diverse cultures and traditions. Visual Literacy. Students are able to analyze two and three dimensional applications in order to interpret and understand the underlying principles of visual communications in the historic and contemporary world. Critical Thinking, Problem Solving, and Information Literacy. To observe and describe the nature of a given situation; to access and evaluate sources of information, draw accurate inferences from this information, and make proper use of this information for a specific purpose. The General Education Program also requires the completion of a First Year Seminar and Senior Capstone course. First Year Seminar introduces students to the essential elements of college coursework. In this course, students write, speak, research, and interact with professors and their fellow students in pursuit of knowledge, critical understanding, and scholarship. Each First Year Seminar topic is of special significance to the professor and (we anticipate) to members of the class. Each major requires a Senior Capstone course that is the culmination of students’ professional and general education studies. The Senior Capstone course marks the conclusion of students’ work both within the major and the general education program. Student Senior Capstone materials will be given to the library to be cataloged and added to the collection and, thereafter, will be made available to the campus community.